A few months back, when I had fifteen minutes to myself while I was waiting for a friend, a quick 'browse and don't buy' session in Superdrugs turned into a mini haul. Among the things that I picked up were a couple of products from the Maybelline range celebrating the company's 100th birthday. 100 years in the beauty industry isn't something to be sniffed at, especially considering they bring us great products at affordable prices. 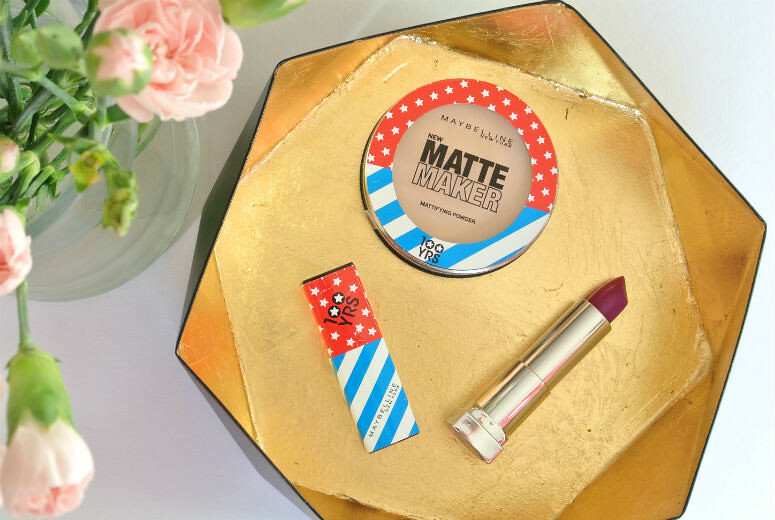 I decided to pick up their Matte Maker pressed powder as well as one of the Color Sensational lipstick in the colour Plum Passion. The products come in specially coloured packaging, with blue and white stripes and red and whit stars. Very Fourth of July! Plum Passion is a bit of an unusual spring/summer colour as it is quite a full-on berry. It's quite a pigmented blue-toned magenta colour that goes on quite full. With a light hand and a bit of dabbing however, it softens to a slightly lighter wash that is suitable for day-wear. I rather like this colour to be truthful. The first time I put it on, it went on a bit full and bright but it sits so comfortably on the lips, it's hard not to like. The powder is in all honesty, just a pressed powder. I don't find this product all that exciting really. It comes in a large flat screw-top package and is very densely packed. I found that with this powder, an extra light hand and a very fluffy brush is needed. The first time I used it was while I was visiting my parents and without my usual tools, so the powder went on very heavy, thick and mattifying to the point of dull. Now that I have had time to play around with it, using my Real Techniques Blush Brush (I like using this for powders rather than blushes), I would say it's a nice enough product to use, but I think I'll still stick to my Hourglass Diffused Light powder for powdering purposes. I bought both of these from Superdrug, but am having trouble finding them online. I did however see that the Mascara in this collection/packaging was available online, so if you're interested in the other lipstick shades or other products in the range, I would suggest heading to a store to look for them. Have you tried any of the products in the 100 years special collection? Who else thinks the packaging for it is extra cute?